Nearly ten years after! 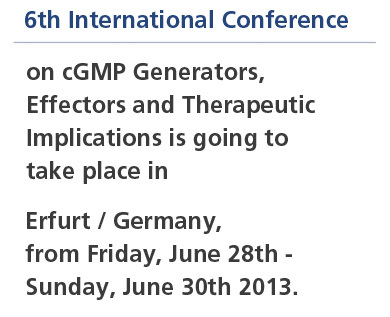 In 2011, the 5th Biannual International Conference on “cGMP” will take place. After a brief visit to Bavaria, we decided to hold the meeting again in an East-German jewel, Halle. This series is now well established and the leading conference in the field of the exciting and important signaling molecule, cGMP. Further breakthroughs in understanding of guanylate cyclase regulation and cGMP effector mechanisms have been made and will be discussed with all world experts being present. The pathophysiological and therapeutic implications including different cGMP-elevating drugs in clinical development are role models of translating basic science into the clinic. Our expanded international organiser team looks forward to say Hallo to you in Halle!